The Whitworth men’s basketball team has been well-known to power through tough conference play before falling abruptly in the postseason. Last year, the Pirates sang the same song. Four seniors and a promising sophomore led Whitworth to a 23-4 record last season ahead of the NCAA Division III Tournament, where the Pirates fell in the first round. The Pirates, who have fought in the Big Dance for 11 consecutive seasons, now face a different battle. The Pirates have no seniors in starting roles this year to guide a team that looks very different from recent seasons. More than half of the roster this year is new to Whitworth, but head coach Matt Logie (143-31, six seasons) is hesitant to admit his program is undergoing a rebuilding process. “It’s more like reloading,” Logie said. 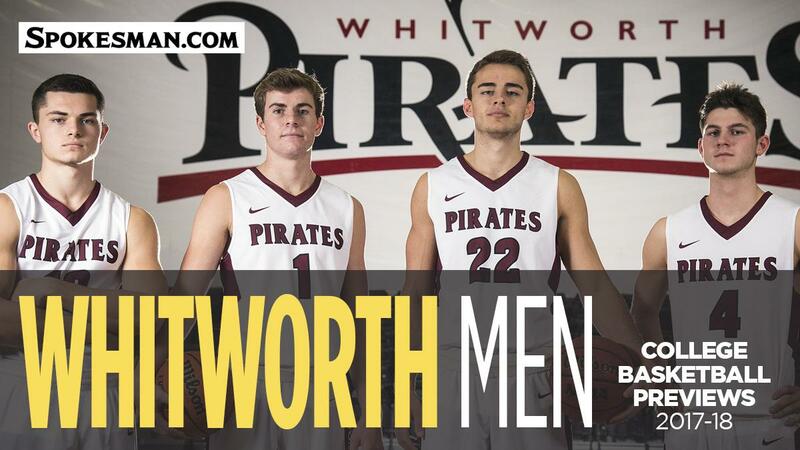 Ten of Whitworth’s 19-man roster are new to the Pirates program. It’s the largest incoming group in Logie’s seven seasons. After losing four starters to graduation, Logie is turning to his lone returning starter, 6-foot-5 junior guard Kyle Roach from Marinwood, California, to lead the young squad. Roach quickly stepped into a leading spot last season, averaging 32.5 minutes – second on the team behind now-assistant coach Kenny Love’s 34 minutes. Roach led the team in scoring at 15.9 points per game, rebounding (5.2) and steals (1.3). Half of the newbies are new to college play. Logie recruited five freshmen this year, including guard Kea Vargas from Gonzaga Prep. The other five fresh faces were picked from other collegiate programs. Jordan Lester, a 6-2 junior guard, transferred to Whitworth after playing two years at Robert Morris University, a Division I school in Moon Township, Pennsylvania. The Sammamish, Washington, native started two games at Robert Morris, but missed the remainder of the season because of injuries and illness. Isaiah Hernandez and Garrett Hull will also bring some experience to the Whitworth Fieldhouse. The two guards are local draws. Hernandez, who transferred to Whitworth after redshirting his freshman year at Carroll College in Helena, was a standout from Lewis and Clark High. Hernandez was named to the first team All-Greater Spokane League in 2016 while guiding the Tigers to the State 4A tournament. Hull, originally from Ellensburg, became a Pirate after playing two years at CC Spokane. Logie lost a lot of size inside after the Pirates were left without 7-footer Drew Sears in the post and 6-5 forward Christian Jurlina because of graduation. Logie made a point to pull in some experienced big men to fill the vacant spots inside. Freshman Chewy Zevenbergen, from Edmonds, Washington, is expected to use his 6-10 stature to provide heavy pressure at the rim behind 6-8 junior center Bishop. Logie also expects forward Reed Brown, a 6-6 freshman from Portland, to run the court well. Brown is quick inside, but can also step out for long shots beyond the arc. “He brings a really unique blend of size and scoring ability,” Logie said. Despite the young roster and the lack of experience, Logie said his rotation still has the potential to be deep this year. But the rest of the Northwest Conference, which is used to seeing Whitworth with experience and size, might not be convinced of the Pirates’ strength come conference play in December. “It’s kind of fun not to be, maybe, the team with the target on your back. And so our guys are embracing the opportunity to build something new now,” Logie said.